Jason Gillespie challenged his batsmen to turn good starts into match-winning innings after seeing another one-day contest - this one against his fellow Australians - slip away. The Sharks gave Tim Paine's tourists a run for their money at a packed-out County Ground at Hove but were bowled out for 220 as they chased a victory target of 278. 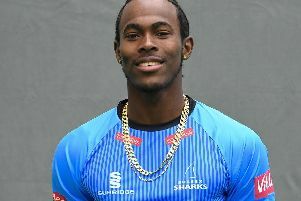 Three wickets for Jofra Archer and two each for Danny Briggs and Luke Wells helped keep the Aussies - for whom Marcus Stoinis scored 110 - below 300. In reply, Phil Salt struck a brutal 62, Laurie Evans 57 and Harry Finch 45 but the chase fell away and they lost their last six wickets for 40 to hand the visitors a victory in opening match of their tour. Sussex head coach Gillespie said: "I think a bit like the Royal London (One Day Cup) it was a missed opportunity to win a game of cricket. "With the ball we started off average but improved to the point where we shut down Australia, particularly in the middle and the back end of the innings. We bowled fantastically well. I thought our efforts in the field were top-drawer. "We were diving around, we were buzzing with a lot of energy, which was great. "With the bat we got some starts. Phil (Salt) played wonderfully well at the top and then Finchy got a start - got over 40 - and Laurie Evans got to 50, but no-one went on. And that was the difference between the two sides. "(Marcus) Stoinis ended up getting 100 and they won the game, so that's something we need to learn from and need to make sure we get better at, converting these starts. We've had a lot of guys into 20, into 30, into 40, but those innings don't win you games of cricket. That's the reality. "We keep talking about 'we've got to learn from it, we've got to learn from each and every situation' and we've got to make sure that we are, that's the key. Someone needs to take it upon themselves to see the job through, and that's the challenge. I'm sure the lads will. It's putting a lot of hard work into training and preparation, which I've been really pleased with, but we need to make sure we're learning every time."